My university is advertising 30 fully funded PhD scholarships for autumn 2016. Basically, there are a list of projects and which ones get funded depends on applications. I am lead on a proposal for a topic in maths/engineering higher education. The description is below, and I would be grateful if you could bring it to the attention of anyone who might be interested. 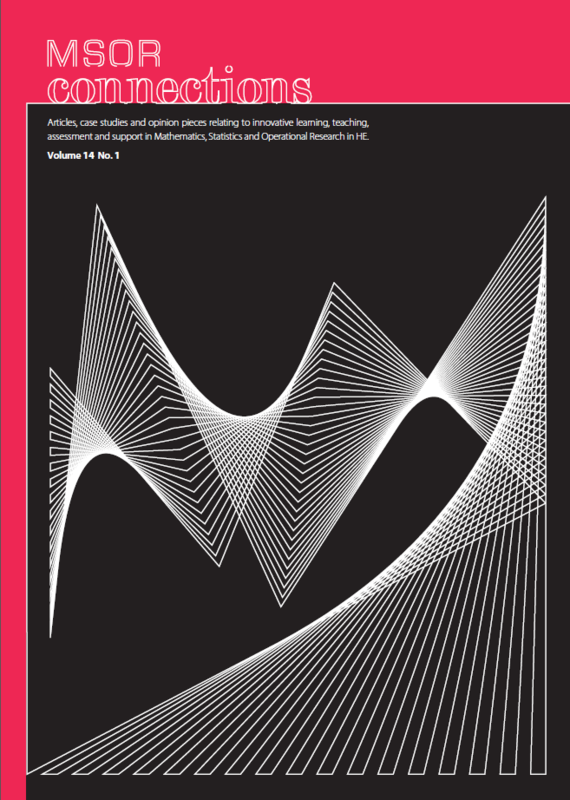 I am now one of the editors of MSOR Connections, a peer-reviewed practitioner journal that welcomes research articles, case studies and opinion pieces relating to innovative learning, teaching, assessment and support in mathematics, statistics and operational research in higher education. I am interviewed about my PhD research and my experience of the viva in the new episode of the Viva Survivors podcast. This podcast, by Nathan Ryder (@DrRyder), interviews PhD graduates about their research, the viva and life afterwards. Mathematical niche-filling news: a few model and set theorists have got together to start a new shared blog “on that hard to define area that is perhaps 80% Model Theory and 20% Set Theory”. It’s wittily called fff, short for Forking, Forcing and back&Forthing1, and it’s run by Andrés Caicedo, Juan Diego Caycedo, Artem Chernikov, John Goodrick, Ayhan Günaydın, Goyo Mijares, Sonat Suer, Andrés Villaveces. … a group of Model Theorists and Set Theorists have decided to put up a blog to explain to ourselves (and whoever reads this) why some result we just submitted to a journal is interesting, why some “classical” theorem (or definition, or notion, or example) is worth revisiting, what is our view on some discussion, what on earth is “such and such fancy concept”. This week, the Freakonomics blog covered research by Stockholm University’s Kimmo Eriksson, which found that including a mathematical equation in the abstract of a research paper made scholars from different fields judge the research to be ‘of higher quality’, even though the equation is unrelated to the work and also complete nonsense. The study included 200 participants, although the amount by which the equation increased the perceived ‘quality’ of research varied between disciplines, and in fact caused a slight decrease for people working in mathematics or science subjects. Via Tim Harford on Twitter. In what must surely now be described as a classic maths news item, yet another species of animal has joined the ranks of things which can determine rank. This time it’s the humble fruit fly’s turn to tap its hoof the correct number of times, as these articles in The Metro and Nature (the two standard science references for their respective ends of the credibility spectrum) describe. Props to The Metro for an excellent headline pun.